Perfect for moving refrigerators, hot water heaters, and other large appliances, this hand truck will save your back without hurting your wallet. It features a rugged steel frame and non-marking pads on the front-side rails, as well as a 3 ply 2 piece manual strap system to make sure your items stay secure. Stair climbers on the back help you move your load securely up and down stairs. Machine can handle a load capacity of 750 lbs. 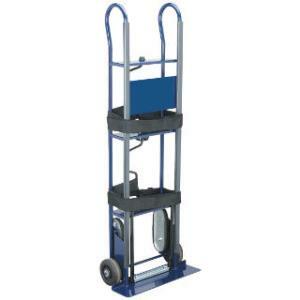 * Please call us for any questions on our appliance hand truck rentals in Hillsdale and Ridgewood NJ.